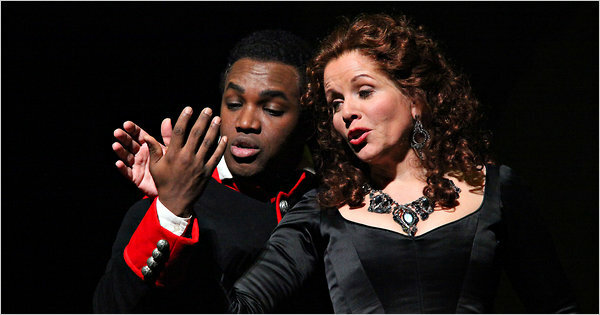 “Armida,” with Renée Fleming in the title role and Lawrence Brownlee as her lover, in the Metropolitan Opera production of the Rossini work. In Rossini’s operas coloratura is character. When critics mention singer X’s trills, Y’s roulades and Z’s runs, they are not just being nitpicky. Qualities like joy and anger are expressed here entirely through those purely vocal means. The emotions are in the notes. This is particularly true for the title character of Rossini’s “Armida,” an Arab sorceress who falls in love with a Christian crusader and is finally abandoned by him. Armida dominates the opera, encompassing seduction, happiness, despair and rage, and Rossini translates her magic powers and charisma into dazzling music. In recordings, especially one from a 1996 performance at Carnegie Hall, the soprano Renée Fleming brought to the notoriously difficult role the bright flexibility and plush, penetrating tone of her prime, and also a thrilling riskiness. Armida lay on the outskirts of her repertory, but it was a triumph. Now in a later stage of her career, Ms. Fleming seemingly wanted to recapture some of that earlier magic, and last year the Metropolitan Opera mounted its first production of the opera for her. Her performance then was uneven, and she fares little better in a dull, disappointing revival that opened on Friday evening. With a voice of reduced agility, size and power, Ms. Fleming now paces herself cautiously, simplifying or dodging many of the coloratura fireworks. In the first and second acts she limits her singing in full voice, clearly saving herself for Act III, in which Rossini ingeniously relaxes the ornamentation as Armida’s powers disappear, and she is left a mere woman. Here, the line lyrical and the range congenial, Ms. Fleming is finally persuasive. But caution isn’t what you want in an Armida, and singing the opera like a one-act misses Act I’s glittering runs and the great Act II aria “D’amore al dolce impero,” moments that establish the commanding and loving sides of this complex character. Ms. Fleming acts naturally, but in this repertory acting and singing are even more unified than elsewhere in opera. Since she doesn’t seduce or dazzle — do what Rossini has built into the music — her later humiliation and rage lose their impact, and the character loses its depth. Mary Zimmerman’s wanly Neo-Classical production doesn’t help locate the depths of an opera about intense emotions and the possibilities and limits of illusion. Instead of passion or fantasy, Ms. Zimmerman tries cuteness: animatronic insects, demons in tutus, a winsome girl personifying love. While adorable may suffice for the frolics in Armida’s enchanted garden, when the opera takes on more heart-wrenching dimensions, the production is stumped. Ms. Zimmerman seems more interested in winking at operatic style — with antiqued footlights, Italianized placards reading “Ballo” and “Fine,” the conceit that Armida is reading her aria from sheet music — than in believing in its complexities. Riccardo Frizza conducted sluggishly, and while the opera features no fewer than six tenors, only Lawrence Brownlee, as Armida’s lover, Rinaldo, sang with freedom and fervor. His Act III solo was the highlight of the evening, a reminder of the infectious excitement Rossini makes possible, if only you do what he tells you. All'accampamento dei crociati presso Gerusalemme, giunge al cospetto del capitano Goffredo la bella Armida, nipote del re Idraote. Ella viene per chiedere aiuto ai crociati, dato che il suo regno è distrutto. Goffredo, all'inizio non vuole cedere soldati ad Armida, poi, su consiglio del fratello Eustazio, cede (Per me propizio il fato) e decide che il capitano dei soldati d'Armida sarà Rinaldo. Il crociato Gernando, alla notizia, s'infuria. Armida e Rinaldo s'incontrano, e s'innamorano (Amor, possente nome). Gernando, furibondo, insulta Rinaldo, e viene ucciso dallo stesso. Rinaldo viene condannato a morte, ma riesce a fuggire dall'accampamento. Un coro di diavoli, guidati da Astarotte (Alla voce d'Armida possente) apre il secondo atto, sul bellissimo palazzo della maga. Giunge Armida con Rinaldo, che è riuscita a rapire. Per sedurre il giovane fa danzare e cantare le larve dell'amore (Canzoni amorose, carole festose) e canta per lui (D'amor al dolce impero). Alla fine, Rinaldo è vinto dagli incantesimi di Armida. Al giardino di Armida giungono Carlo e Ubaldo, due crociati che, guidati dal mago d'Ascalona, devono riportare Rinaldo al campo dei crociati. Allontanate delle Ninfe, i due osservano arrivare Armida e Rinaldo, e il crociato viene lasciato solo. Carlo e Ubaldo lo raggiungono e lo esortano a tornare all'accampamento: Rinaldo confessa loro che è stanco di vivere tra le mollezze del palazzo della maga, e decide di lasciare Armida, pur nolente. Armida, disperata e poi infuriata, distrugge il palazzo che ha creato per Rinaldo (È ver, gode quest'alma).